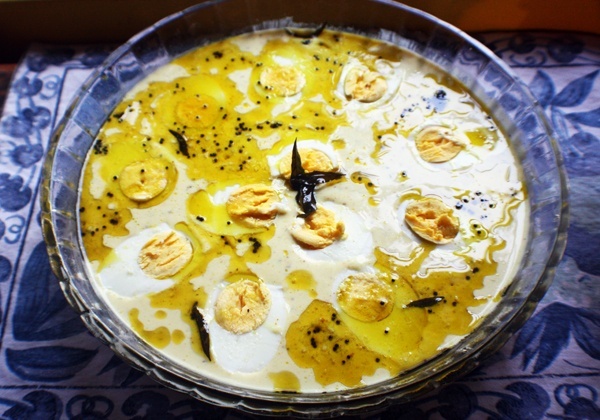 Yogurt and Egg is an unusual combination but a very tasty one ! Hard boil the eggs. Peel and cut into halves and keep aside. Take 2 tbsp of Mustard seeds, green chillies and turmeric and grind to a smooth paste. Add a bit of water if required. Add the paste and salt to the yogurt and whip it up so that the paste mixes nicely with the yogurt. Pour the yogurt into a shallow dish and dunk the egg halves into the yogurt. In a pan, heat the oil and add the asafoetida . Add 1/2 tsp Mustard seeds and curry leaves and pinch of turmeric. When the curry leaves start changing colour from green to a dark brown, take the pan off the heat and pour the mixture over the eggs and yoghurt. Serve with rice and lentils. This entry was posted in Egg, Grand Ma's Recipes by Kamakshi. Bookmark the permalink. Yummy and def new to me but I will try it for sure.